In the picture of the Ukrainian artist Nikolai Pymonenko “Brod”, an episode from the life of the Ukrainian hinterland is depicted. 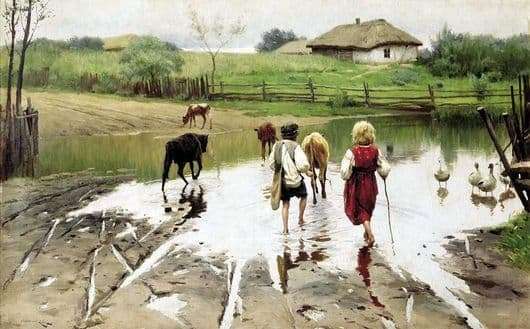 The artist tried to convey the feeling of joy and carelessness to the children who, despite the obstacle, in the form of a river do not lose heart and go barefoot into a ford. Probably, they are returning from the meadow, where they herded calves. Humor to the picture is given by the geese depicted on the right, who are surprised to see a cheerful company. Probably, children are not the first to return from this work. In the villages, young children had to graze cattle, which was a routine for them. Brod is not at all an obstacle for young villagers. They pass it far from the first time. And this is clear, because in the picture there is no hint of anxiety, insecurity or fear. This makes it clear the absence of disturbing tones. A sense of calm is also transmitted through the soft green shades of trees and grass. The river is depicted very beautifully in the picture, it reflects the leaning scourge and sandy shore. On the boy’s shoulders, he had a knapsack, which most likely had a dinner of little shepherds. The girl in the hands of the twig, which chases calves. Behind the river you can see the house, in which children are most likely in a hurry. The picture is very positive, bright red dress on the girl gives the mood of the artist’s work. The artist watches over the children and is moved by the childlessness of the child, but truly adult diligence of the young shepherds. The same feeling is transmitted to the viewers of the picture. In his writings, Nikolai Pymonenko addresses the topic of the Ukrainian Village. Therefore, he, like no one else, managed to convey the spirit, the beauty of the nature of the Ukrainian land and the good nature of the Ukrainian people. This picture is also no exception. Even the colors that depict the painting “Wade” are kind – the colors used are not harsh, light, soft. Painting Pimonenko “Brod” is currently in the Odessa Art Museum.